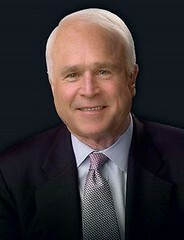 A look at Mr. McCain’s 25-year record in the House and Senate, his 2008 campaign positions and his major speeches over the last three months indicates that on big-ticket issues — the economy, support for continuing the Iraq war, health care — his stances are indeed similar to Mr. Bush’s brand of conservatism. Mr. McCain’s positions are nearly identical to the president’s on abortion and the types of judges he says he would appoint to the courts. Keep repeating it, kids - A McCain in the hand is worth a third term of Bush.